The 4 star Hotel has the chance to be immersed in an enchanting flourishing park with palm trees, that stretches down to the sea. The venue is Santa Margherita di Pula, in the south-western coast of Sardinia, about 40 Km from the main airport of Cagliari. The sea is 60/220 meters from the buildings: the coastal stretch where the park of the hotel overlooks has sometimes posidonia, that indicates the pure and uncontaminated state of the sea. The hotel Costa dei Fiori does not have a private beach, but the wonderful beaches of Chia, Nora and Teulada are easy to reach by car. The shuttle service is available on payment. The classic and fresh style of Hotel Costa dei Fiori recalls Sardinian traditions and create a welcoming and relaxing atmosphere. The park stretches until a wonderful swimming pool with sea water that offers a splendid panoramic view over the sea and the territory. 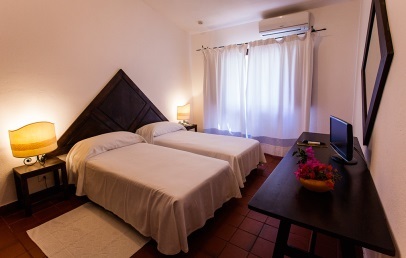 The hotel has 82 rooms and Suites, furnished and studied to give a particular attention to single details, in order to provide a comfortable and relaxing stay. Classic Bouganville – 25 sq.m., bathroom with shower, shared terrace/patio, most with park view. Superior Ibiscus – 27 sq.m., bathroom with shower, wide window with park view and private terrace or patio. Family Suite – 50 sq.m., main bedroom with living corner + 1 connecting children bedroom. Private patio. Family rooms are composed by two connecting rooms, with one entrance. Suites – 40-60 sq.m., tastefully decorated in Mediterranean style with antique original furniture of the XVII and XVII centuries. Composed by a bedroom and a private terrace with view over the park. They can accommodate a max. of 2 adults and a child. A children pool is available for the young guests. A baby sitting service is available upon request and with a supplement. La Pergola restaurant offers a traditional, Mediterranean cuisine. On request, special menus for vegetarian and intolerances can be prepared. The hotel features three pools: one is dedicated to children, one is with whirlpool and the third, panoramic one is with sea water and equipped with free deck chairs and sun umbrella, while sun towels are on payment. The Wi-Fi connection is available free of charge and guaranteed in public areas. The hotel Costa dei Fiori have a tennis court, while several other sport activities are available in the nearby and can be booked at the reception desk: Golf 18-holes (2 km), Diving (4 km), Boat/rubber dinghy rental, riding, excursions, windsurf, bike and scooter rental. Tourist tax – The municipality requests the payment of € 2,00 per person per overnight, to be paid on spot. Children up to 12 years are exempted. Subject to changes. Furnished in traditional style, with essential and simple elements and furniture made ​​by local craftsmen, the Classic rooms are located in the park and feature a private shower bathroom. Shared terrace or patio, most have park view. 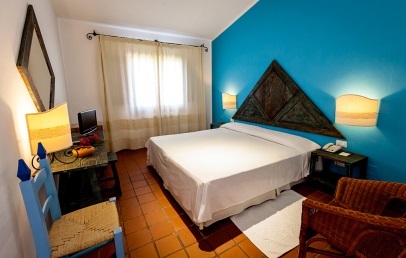 Furnished in traditional style, handmade furniture inlaid with typical Sardinian style, the Superior rooms are located in the park and feature a private bathroom with shower. A window opens into the park. Private patio or terrace. Comfortable Suite furnished in ancient Mediterranean style, with original furniture dating back to XVII and XVIII century. Most of the bathroom have a whirlpool, some have a shower. The Suite has a private terrace with view over the park and the pool. An evening turndown service is included. 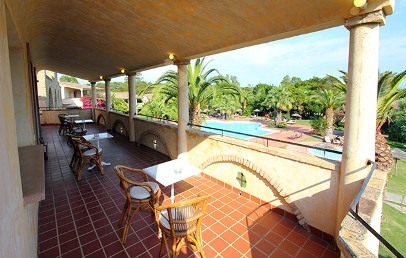 Spacious Suites with one entrance and located near the main building and the pool. The Suite has a main bedroom/living room with own bathroom with shower and a separate bedroom, ideal for children. Both rooms have a TV, air conditioning, minibar, safe, hairdryer. The Family Suite offer a private patio with view on the park. 20% reduction for stays from July 1st to 31st, booked within May 31st 2019. The offer is a non-refundable one and the total amount of the stay is to be paid upon confirmation.